The Conflow Code 1431 - Inline Check Valves permit movement of flow media in one direction only. A light spring is fitted to assist valve closure at low pressure differentials across the valve. 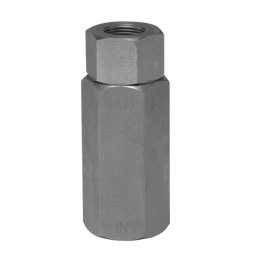 The valve, being in-line, fits compactly into a pipe line with minimum obstruction. May be used horizontally or vertically. For use with oil, water and air. On water dust suppression systems on mineral cutting machines to keep the pipelines "charged" with water so that the spray heads energise instantaneously when the supply valve is next turned on.